The opening of A View from the Bridge makes reference to the timelessness of the story, that the tale unfolding around Eddie Carbone could as much have been told to a lawyer in ancient Rome as one in 1950s Brooklyn. 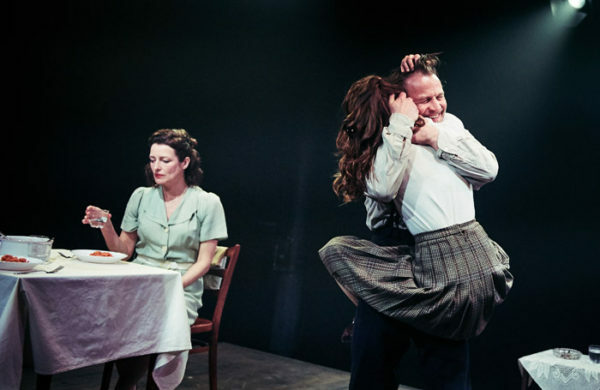 There is a certain sense of timelessness about the Tobacco Factory’s production; it feels like a version of the play that could have been seen in pretty much any place at any time since it was written. Something about Mike Tweddle’s production reminds me of when you see theatre presented in American films (the specific example I have in mind is Birdman but there are many others). Everything is a little too heightened while attempting to appear natural, and everyone sounds like they are Acting Their Lines Very Well. Even within this style there are elements that detract from the play: some accents seem forced and occasionally slip, there are moments of strained performance, and a dramatic echo effect on the final scene all serve to emphasise that this is a production striving for intensity, and not necessarily achieving it. There are still strong moments in the show – I particularly liked the part showing Rudolpho with his co-workers, disproving before our eyes Eddie’s theories that they mocked him – and the performances are solid, despite seeming constrained. Months ago, when the theatre announced they were using a community chorus I was quite sceptical. Quite apart from my general feelings about community choruses (which are too long and contradictory to go into here) there were two major points that sprang to mind. Firstly, I thought its inclusion in a play so obsessed with community standing and surveillance was interesting and appropriate. However the fact participants had to pay £60 for a 10 week acting course prior to the run felt strange and inappropriate. That is a very reasonable price for an acting course, but surely the unpaid labour of the participants performing for a week of the run each should cover their fee – especially as presumably at least some of those sessions were used as rehearsals for the show. While those I know who took part in the community chorus enjoyed it, seeing the show did not assuage my doubts at all. For most of the production, the community chorus weren’t to be seen at all. When they were visible it took quite a while to identify them – they move set, occasionally walk across the stage in street scenes and play the scripted roles of the immigration agents and horrified onlookers. In all of these parts they are performing beside, and are often indistinguishable from, several of the paid, professional actors; a credit to their talents but begging the question of why they were not being paid also. Overall, this is not the production to go to if you want to see something new discovered in Arthur Miller’s play, or an exciting re-interpretation. It is, however, probably a good choice if you don’t know the work and want to see it live. Everything good about the original is still there – the uncomfortable sense of inevitability, the dissection of an odd family dynamic, and what I would argue is the best visual image in any nominally naturalistic play. It’s just a shame the production seems to highlight the canonical nature of the text rather than its vitality or relevance. A View from the Bridge is on at the Tobacco Factory in Bristol until 12 May 2018. Click here for more details.